Graphite has enjoyed increased interest in recent years thanks to expected growth in demand for electric vehicles. However, China is the top producer of graphite by far, and it’s not particularly easy — or desirable — to invest in companies mining graphite there. Many investors are instead looking to North America for graphite opportunities, especially since Tesla’s (NASDAQ:TSLA) announcement that it plans to source the lithium, graphite and cobalt it needs for its Nevada-based gigafactory from companies working on the continent. In 2015, Tesla backed up that statement by signing two lithium supply deals with companies whose projects are in North America. But while investors are keen to take stakes in North America-focused graphite companies, there are very few companies actually producing graphite in the region. In fact, in 2017 only two North American countries produced any graphite at all — Canada put out 30,000 MT of the metal, while Mexico produced 4,000 MT. The US produced none at all. For those reasons, market watchers are wondering whether North American graphite production is set to rise, and in particular whether graphite mining in the US will ever happen. On that note, here’s a look at the history of US graphite production and what may be next. Graphite is deemed a critical material by the US, and about a century ago it was mined abundantly in the country, mostly in Alabama. A New York Times article states that in 1916 the country produced 10.9 million pounds of crystalline graphite, while in 1917, it put out 2,622 tons of amorphous graphite. However, according to a report from the US Geological Survey, graphite mining in the US has long since stagnated. In fact, the metal has not been mined in the country since 1990, when United Minerals suspended operations at its graphite mine in Montana. As a result, the US now imports all of the graphite it requires. In terms of exactly how much the country needs, another US Geological Survey report states that in 2017, 95 US firms consumed 24,000 tons of natural graphite valued at $42.9 million. Total imports for that year stood at 50,000 tons of natural graphite — of that amount, 75 percent was flake and high-purity graphite, 24 percent was amorphous graphite and 1 percent was lump and chip graphite. The US’ main sources of graphite for the year were China (35 percent), Mexico (31 percent), Canada (17 percent) and Brazil (8 percent). The other 9 percent was derived from various other sources. The US mainly used that graphite in brake linings, foundry operations, lubricants, refractory applications, powdered metals and steelmaking. Demand for graphite is closely tied to steelmaking and manufacturing, but is now also closely associated with the production of lithium-ion batteries. Interestingly, these batteries actually contain 10 to 30 times more graphite than lithium. Tesla’s gigafactory and policy of sourcing materials from North America is playing a significant role in driving demand for US-produced graphite. The company is planning to add additional gigafactories in the coming years, and other manufacturers are following suit. According to Benchmark Mineral Intelligence, at the end of 2017, 26 battery cell plants were due to either expand capacity or come online by 2021. Another potential graphite demand source is the US government via the US Department of Defense’s stockpile requirements, which includes materials like graphite. While recent reports show no graphite shortfall, the stockpile requirements illustrate the importance of US-produced graphite when it comes to national defense. It’s important to note that graphite demand changes based on the type of graphite. Flake, amorphous, vein and synthetic graphite differ in their uses, and when it comes to the emerging battery market, graphite sources also have to be high in purity. It’s clear that while graphite mining in the US is not happening right now, the country recognizes that it’s something that needs to occur. Even so, currently there are not very many companies targeting graphite mining in the US. Graphite One has branded the graphite at Graphite Creek as “STAX graphite” in recognition of its four distinguishing features — the company says graphite at the deposit is Spheroidal, Thin, Aggregate and eXpanded, making it advantageous for use in lithium-ion batteries. The firm released a resource estimate for Graphite Creek in 2015, and put out a preliminary economic assessment (PEA) for the project in 2017. That same year, Graphite One began narrowing down its list of potential sites for a refinery. In February 2018, the company announced that the Alaskan government had introduced a bill enabling the Alaska Industrial Development Export Authority to issue bonds to help finance infrastructure and construction costs for Graphite Creek. Alabama Graphite (TSXV:CSPG) is another company aiming to bring back graphite mining in the US. It holds two flake graphite projects in Alabama: Coosa and Bama. Respectively, they are in Coosa County and Chilton County, and Alabama Graphite says both are “within the heart of a previously producing region.” Alabama Graphite has completed a resource estimate and PEA for Coosa, and in July 2017 it awarded AGP Mining Consultants the contract for a feasibility study for the project. At the end of 2017, Westwater Resources (NASDAQ:WWR) announced plans to acquire Alabama Graphite in order to fast track US battery materials development. The new company will aim to provide specialized graphite for use in batteries worldwide. The deal was approved in mid-March; the same month, Westwater released an optimized business plan for Coosa. More details are still to come. Certainly those interested in graphite mining in the US will be keeping a close eye on both of these companies. 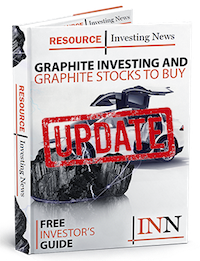 Editorial Disclosure: Graphite One Resources is a client of the Investing News Network. This article is not paid-for content. Not sure what this article is talking about when it says that the US produces no graphite. I worked for a company that synthesized graphite from petroleum coke within the USA.